As Europe and the world celebrate 100 years since the end of World War I – arguably one of history’s most senseless and bloody conflicts, which saw around 37 million military members and civilians killed for, essentially, colonialist posturing by a handful of monarchs – Poland commemorates more specifically the anniversary of its return to independence after 123 years of partition between Russia, Prussia, and Austria. This particular day was chosen because it was on 11 November 1918 that Józef Piłsudski returned to Warsaw from German imprisonment to be granted control of Polish military forces, effectively taking leadership of a newly independent country: the Second Polish Republic, which lasted until the takeover of Poland during the next World War by Nazi Germany and the USSR. 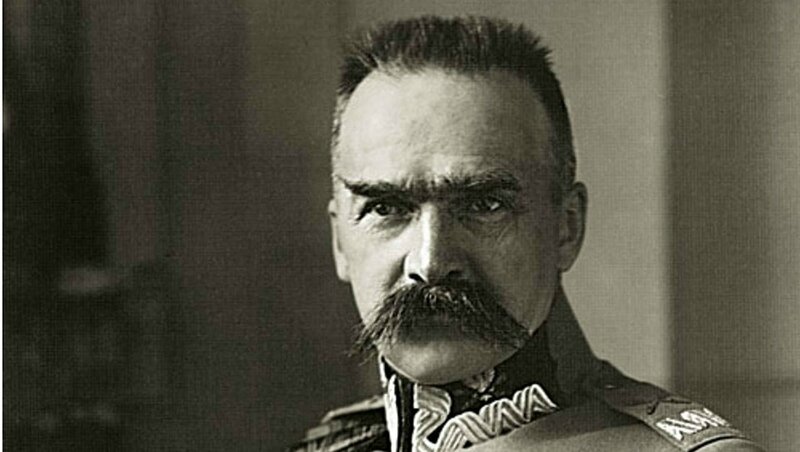 Piłsudski – now widely considered to be one of Poland’s greatest heroes and leaders – was a socialist who supported a multi-ethnic Polish state. Although a military man who was preoccupied with matters of security (especially against the Soviet Union) and believed a strong sense of national tradition was key to the country’s unity, he stood in contrast to his chief rival Roman Dmowski, a vocal anti-Semite who believed that the only true patriots were those who were Catholic and spoke Polish. It is ironic, because 100 years on it is Dmowski’s vision of Poland which seems to dominate the national Independence Day. For the past decade, 11 November in Poland has been marked most notably by aggressive marches by far-right groups, especially in Warsaw. Clashes between police and marchers in 2012 and 2013 led to mass arrests and some injuries in the capital, as well as the burning of a local rainbow sculpture which had come to symbolize the LGBTQ movement. There has been less violence in recent years, along with separate, formal parades in the capital supported by the government – which has variously led to charges from the left that the government is tacitly condoning the nationalist marches, and from the right that the media is overly focused on fringe groups over more peaceful and positive celebrations. Nevertheless, ultranationalists still overwhelm the narrative of the holiday. Last year an estimated 60,000 marchers led chants such as “Death to enemies of the homeland” and “Catholic Poland, not secular,” bearing banners with slogans like “White Europe” and “Refugees get out”. The right-wing marchers’ slogan of 2017 was “We want God,” taken from a speech a few months earlier by US President Donald Trump in Warsaw. Some participants openly identified as fascists. This year, out of fear that the centennial could get out of hand, Warsaw’s outgoing mayor Hanna Gronkiewicz-Waltz attempted to ban the march, but her decision was overturned by the courts. (Anxiety about this year’s security has only been exacerbated by a police strike, and the US State Department warned citizens in Warsaw to “keep a low profile”.) Polish prime minister Mateusz Morawiecki and president Andrzej Duda from the ruling right-nationalist Law and Justice (PiS) party then said they would join the official parade led by veterans. Although they have had harsh words for the right-wing extremism on display in the past, Morawiecki and Duda have been criticized by scholars such as Jacek Kucharczyk, head of the Polish think tank Institute of Public Affairs, for “mainstreaming the far-right.” PiS has also made controversial changes to the judiciary and moves against press independence which many observers in Poland and internationally characterize as a shift toward antidemocratic right-wing consolidation of power. In Krakow, Independence Day celebrations have been less heated. Today Krakow mayor Jacek Majchrowski, who was recently reelected for a historic fifth term, began the ceremonies by laying flowers to commemorate Polish soldiers before a mass at Wawel Royal Cathedral, and later national songs were sang by choirs in the Main Square and there was a memorial ceremony before the Tomb of the Unknown Soldier. Also there will be an annual Independence Day run, now in its fifth year. At 17:00 on the Main Square there will be more patriotic songs, and at 19:00 there will be a special concert at the ICE Congress Center at 19:00 led by pianist Paweł Kaczmarczyk featuring songs inspired by Poland’s founding and history, as well as a quartet of patriotic singers at the Military Parish Church. St. Agnieszka. For their part, most average Poles seem to view independence day as most people in other countries do, with a peaceful sense of national cheer and celebration of history and identity rather than xenophobia and aggression. Most I spoke to expressed regret and annoyance at the prevailing ultranationalist narrative, comparing Poland’s Independence Day unfavorably to, say, the fireworks and high school marching bands on the Fourth of July in the US. Whether or not the vision of Warsaw or Krakow – Dmowski or Piłsudski – will prevail over the spirit of Poland’s independence remains to be seen, even a century later. The answer, just as for the spirit of the Polish people and their politics in general, probably lies somewhere in between. If the majority of Poland wants out of Europe let them go! But then no more polish workers to Europe, no more trade with Europe and others. And Catholics mustr return to where they belong, italy. All polish outside Poland must return immidiately, no more aid or anything. Please do starve, as that is what you want. Trading with other countries and sharing employees was far before creation of the UE because it brings profits to everyone. Leaving the UE (which is not currently considered) won’t change anything. Shame the world’s media concentrated on the extreme fringe, but that was predictable. I’ve just been staying with friends in Poznan and the celebrations could not have been more different than the photos from Warsaw. After the scenes which went round the world, maybe PiS will now get booted out. 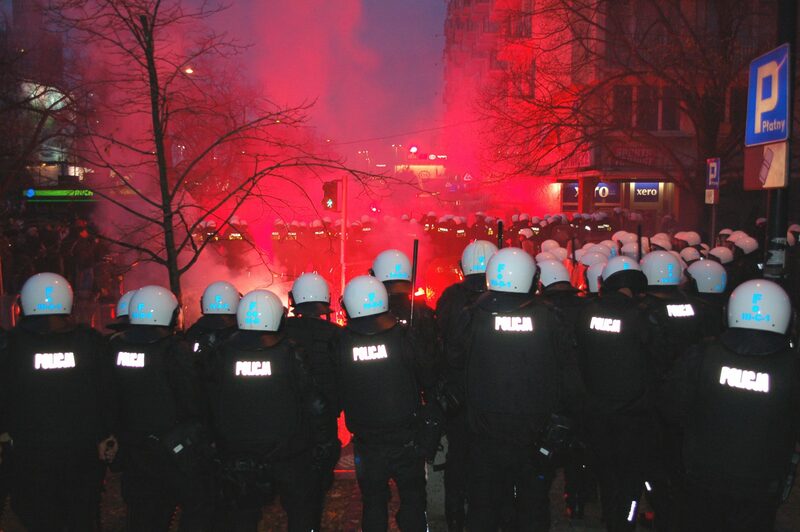 Ugly scenes in Wroclaw. This governement is completely useless. “Somewhere in between” would be the spirit of the great Paderewski, who managed to mediate between Pilsudski and Dmowski, two men who absolutely hated each other. I am sorry, but journalist level of this article is below muddy bottom of the Vistula river. First of all, a few of incidents from previous years was inspired by government of Civic Platform (PO). Police provocations, burning security booth next to Russian embassy (we know that from recorded conversations from restaurant) – these only examples from number of actions. Burning rainbow was probably made by nationalists, but you have keep in mind that sculpture was intended as temporary and it was provocatively built in front of church. Please note that after government change marches are mostly peaceful. Secondly, far right nationalists are margin during these marches. Of course, these are organised by them but mostly participants are common families with children who just want to celebrate Independence Day. Additionally, extremists with racist slogans were condemned by organisers. Past year slogan “We want God” isn’t taken from Trump’s speech, but from French song made in XIX century (Nous voulons Dieu). Considering that 2 years ago in Poland we celebrated 1050th anniversary of the Polish baptism it isn’t something unusual that catholic references are used during marches. Especially since a large majority of Polish citizens are catholic. Law and Justice (PiS) party isn’t nationalist party. They rely heavily on the EU and want Poland to be a member of the Union. Defining them as right wing of political scene is also controversial if you look at their social (socialists) ideas. One more word about press independence. Now situation isn’t worse than few past years. During government of Civic Platform journalists were massively overheard by state units and there was even an attempt to take over journalistic materials. Now we aren’t witnesses of actions like this. And Press Freedom Index is lower than before because member of Reporters Without Borders, creator of the Index, is Michnik, oppositionist journalist from Gazeta Wyborcza, which is cut out from state support for 2 years. In fact, in Polish law there is nothing new which could be alarming. Most of these informations I was able to find in a few minutes. Please, do better research next time. Piłsudski and Dmowski – “Poles apart”, as one of my good friends would say. Paderewski’s greatest contribution towards the re-emergence of Poland was the influence he had on politicians in the United States. I recommend a biography by Adam Zamoyski. I thought I would do my commenting on Twitter, but the very day that I signed up and started posting comments, some relations of mine got a very strange anonymous phone call. Complete coincidence? Perhaps. But for their sake, I have de-activated my account. About the international coverage: some foreign papers seemed to be expecting the worst after last year’s scenes. Admittedly, red flares may not be a particularly edifying spectacle to some observers, but on the whole, genuine and peaceful patriots outnumbered the troublemakers in Warsaw. But even the Guardian, a paper which is usually a good and reliable source of impartial news, indulged in a bit of bias, in my opinion. The story about the South Africa-Poland connection may have been an important bit of reporting, but in journalism, timing is also important. Why did the editor choose to run it the day before the march? Couldn’t it have waited until this week, perhaps? There is a lot wrong with extreme nationalism in Pollnd right now, and PiS do not seem to be getting a handle on it, but there also seem to be some real anti-Polish attitudes cropping up here and there. Some Polish nationalists as well as some outside observers would do well to open the occasional history book. Poland – in form or another – did actually exist before 1918. About the international coverage: some foreign papers seemed to be expecting the worst from the Warsaw march after last year’s scenes. Admittedly, red flares may not be a particularly edifying spectacle to some observers, but on the whole, genuine and peaceful patriots outnumbered the troublemakers. There is a lot wrong with extreme nationalism in Poland right now, and PiS do not seem to be getting a handle on it, but there also seems to be a measure of what can only be described as anti-Polishness cropping up here and there outside of Poland. Some Polish nationalists as well as some outside observers would do well to open the occasional history book. Poland – in form or another – did actually exist before 1918. “In one form or another”, of course. Even during the 123 years of partition, Poland still existed in people’s hearts and minds. The march was a peaceful and family-friendly event. Please, don’t reverse facts. Polish people wanted to show their patriotism and celebrate independence. There is nothing wrong about it. The photo was taken 6 years ago. How can you even post it here as a main photo of the article? Don’t trust everything that media says. Think and do your research on your own, please. The fact is, the march was organized by rightwing groups and Polish governement did not take it over as they should have done. 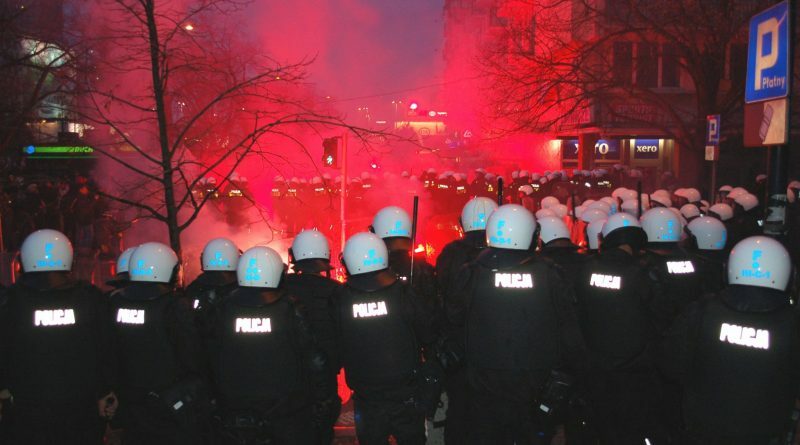 It may have been peaceful in Warsaw mostly except for burning of EU flag but not in Wroclaw. Kaczynski has paid tribute to his brother and now he should go. Most of the march was peaceful and credit where credit is due: the police and the army. But you know as well as I do that some individuals marching displayed extremely unpleasant attitudes, and, unfortunately, these people usually get all the publicity. What I can’t understand is why it was never a government-sponsored event in the first place. They’ve had all the time since they came into power a few years ago to prepare for this huge and important celebration. They must have known the world would be watching. Instead they cobbled together something at the very last minute which looked a bit shambolic when compared to how the day went in other European capitals. Meanwhile, changing the subject – (as the Prezes and co are now doing after their PR disaster)- an item has appeared in the Guardian which reads “Fox News backs CNN fight against White House over Jim Acosta’s press credentials”. So this is an interesting development. Rupert Murdoch shows solidarity with the reporter. The printer’s ink running through his veins outweighs any other consideration. “Journalist” would be more appropriate than just “reporter”. Acosta is CNN’s Chief White House correspondent. One of the banes of our age of technology is the spread of anonymity. People posting anonymous comments tend to be less inhibited than they would be if they were forced to reveal their identity. It’s a bit like drivers in traffic swearing at each other safe in the knowledge that they don’t actually have to physically confront each other. A similar thing seems to happen with far-right or far-left marchers who mask their faces even though they are marching legally. Anonymity can be fun – (I recommend wearing a gorilla suit) – but in the comments sections it can also lead to avoidable incivility. Not that anything like that would happen at the Kraków Post, of course. Ultranationalism may not be to everyone’s taste, but far-right extremism – which takes the form of (anti-Polish) neo-Nazism is something else. The government now seems to be saying that a television channel (TVN) is essentially manufacturing extremists for their own purposes. This seems to be in line with their usual explanation that any extremists must be “provocateurs”. It can be quite fascinating observing the workings of PiS. Are they heading for another confrontation with the USA over TVN? Last time they ended up backing down over trying to fine the same TV station. Somebody could correct me if I’m wrong, but I dont think there was actually any evidence of masked far-left people this year. Point of accuracy.